RAW-Dual™ (IRF-Lucia/KI-[MIP-2]SEAP) cells were generated from RAW 264.7 murine macrophages, which express many pattern recognition receptors (PRRs) such as the Toll-like receptors (TLRs) TLR2 and TLR4 , the cytosolic DNA sensor (CDS) cGAS , and the cyclic dinucleotide (CDN) sensor STING . RAW‑Dual™ cells stably express two reporter genes encoding SEAP (secreted embryonic alkaline phosphatase) and Lucia luciferase. SEAP expression depends on the activation of the endogenous MIP-2 promoter. MIP‑2, also known as CXCL2, is the murine homolog of human IL-8, a chemokine produced in an NF-κB-dependent manner . The MIP-2 ORF has been replaced by the SEAP ORF using knockin technology. Hence SEAP expression reports activation of NF-κB. The Lucia luciferase gene is under the control of an ISG54 minimal promoter in conjunction with five IFN-stimulated response elements (ISRE). It reports activation of interferon regulatory factors (IRFs). 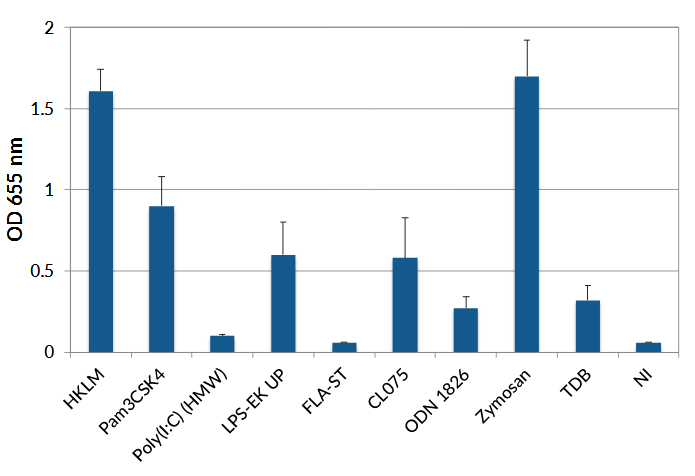 Both reporter proteins are secreted and readily measurable in the cell culture supernatant using QUANTI-Blue™, a SEAP detection reagent, and QUANTI-Luc™, a Lucia luciferase detection reagent. Alternatively, SEAP activity can be detected using HEK-Blue™ Detection, a cell culture medium allowing real-time detection of SEAP. 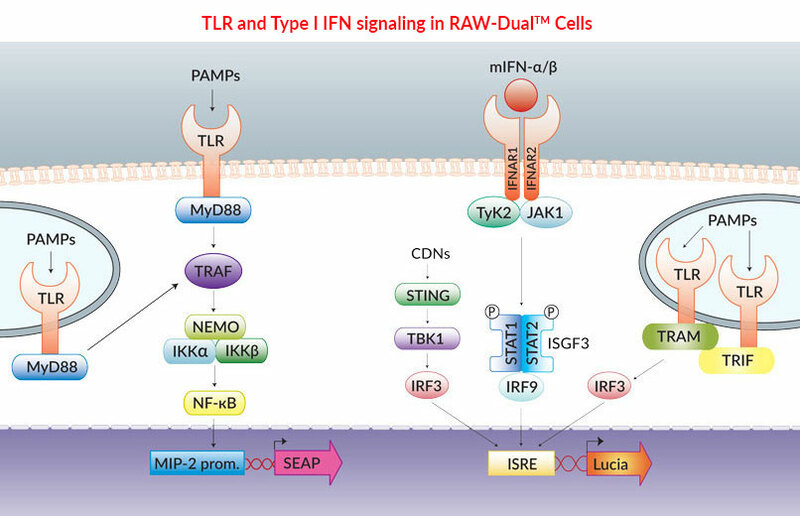 As a result, RAW-Dual™ cells allow to simultaneously study the NF-κB pathway, by assessing the activity of SEAP, and the IRF pathway, by monitoring the activity of Lucia luciferase. RAW-Dual™ Cells are resistant to Zeocin™. 1. Underhill DM. et al., 1999. The Toll-like receptor 2 is recruited to macrophage phagosomes and discriminates between pathogens. Nature. 401:811-5. 2. Hornef MW. et al., 2003. Intracellular Recognition of Lipopolysaccharide by Toll-like Receptor 4 in Intestinal Epithelial Cells. J Exp Med.198:1225-35. 3. Tanaka Y. & Chen ZJ., 2012. 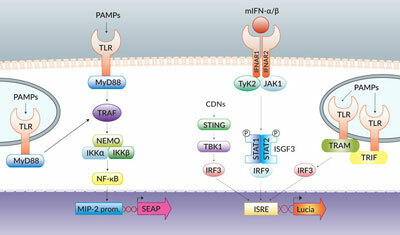 STING specifies IRF3 phosphorylation by TBK1 in the cytosolic DNA signaling pathway. Sci Signal. 5(214):ra20. 4. Kim DS. et al., 2003. NF-kappaB and c-Jundependent regulation of macrophage inflammatory protein-2 gene expression in response to lipopolysaccharide in RAW 264.7 cells. Mol Immunol. 40(9):633-43. 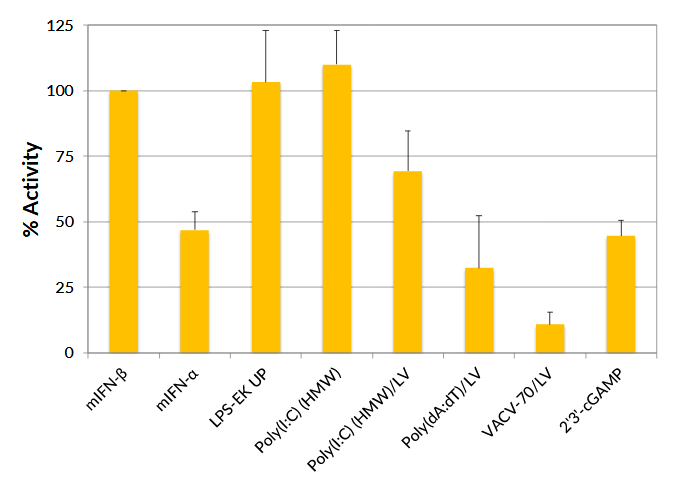 RAW-Dual™ cells were stimulated with murine IFN-β (mIFN-β; 1x104 U/ml), mIFN-α (1x104 U/ml), LPS-EK Ultrapure (100 ng/ml; TLR ligand), poly(I:C) HMW (1 μg/ml; TLR3 ligand), Poly(I:C) HMW/LyoVec™ (1 μg/ml; RIG-I/MDA5 ligand), poly(dA:dT)/LyoVec™ (1 μg/ml; RIG-I ligand & cytosolic DNA sensor (CDS) ligand), VACV-70/LyoVec™ (1 μg/ml; CDS ligand), and 2’3’-cGAMP (10 μg/ml; STING ligand). After a 24h incubation, IRF activation was determined by measuring the relative light units (RLUs) in a luminometer using QUANTI-Luc™, a Lucia luciferase detection reagent. The IRF induction of each ligand is expressed relative to that of mIFN-β at 1 x 104 U/ml (taken as 100%). RAW-Dual™ cells were incubated with HKLM (1x108 cells/ml; heat-killed Listeria monocytogenes, a TLR2 ligand), Pam3CSK4 (1 μg/ml; TLR2 ligand), poly(I:C) HMW (10 μg/ml; TLR3 ligand), LPS-EK Ultrapure (1 μg/ml; TLR4 ligand), FLA-ST (10 μg/ml; TLR5 ligand), CL075 (1 μg/ml; TLR 7/8 ligand), ODN 1826 (1 μg/ml; TLR9 ligand), Zymosan (10 μg/ml; TLR2 & Dectin-1 ligand), TDB (100 μg/ml; Mincle ligand). Non-induced cells (NI) have been included as a negative control. After a 24h incubation, NF-kB activation was determined using QUANTI-Blue™, a SEAP detection reagent, and by reading the optical density (OD) at 655 nm. The biallelic replacement of the mouse MIP-2 (also known as CXCL2) gene with the SEAP reporter gene was verified by PCR and sequencing. The inability to produce MIP-2 has been confirmed by ELISA. RAW-Dual™ cells are guaranteed mycoplasma-free.